If you are getting ready for your first year of college, you are probably feeling a bit anxious and uncertain. Take comfort in knowing that you are not alone. Whether attending a local community college or a big university, most first year students share similar concerns and fears. I survived that first year and was asked to provide a few suggestions on how to approach this exciting new challenge in your life, make the most of new opportunities, and succeed in college. College, like most things in life, will be what you make of it. You can become involved in your college community by joining clubs, attending sporting events, and meeting people, or you can take online classes and barely leave your dorm. I recommend the former. College will provide you with the opportunity to meet many different kinds of people from all over the country and world. It is a fantastic chance to branch out, learn new things, and figure out who you are and what you like. From galloping racehorses as a teenager to teaching chemistry to college students, Detective Patrick Lamb followed an unusual path to get to his current vocation as the expert Fingerprint Examiner for the Fredericksburg Police Department. Lamb was born in Richmond and grew up on his family’s farm, the historic Sycamore Hall (circa 1790) in Hanover County, where his parents raised and trained Thoroughbred horses for the racetrack. Since he was small and light enough as a young teen, Lamb rode many of the horses at home to help prepare them for a racing career. As an only child, it would have been natural for Lamb to follow in his father’s footsteps and make his living with horses. But Lamb had a strong interest in science and a passion for learning. 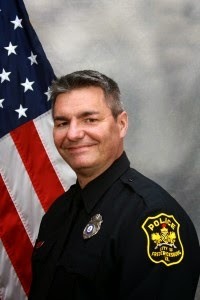 He attended the University of Richmond and earned a degree in chemistry, graduating in 1987. He followed up with post-graduate education at Old Dominion University and Virginia Commonwealth University, specializing in enzyme research, and for over ten years he worked as a professor in chemistry at J. Sargeant Reynolds Community College while he continued his doctoral studies. Getting Involved, the Reynolds Way! Reynolds Community College, like most any college or university, has a student life. While it may not be as expansive as that of a four-year college or university, the quality of the student life here at Reynolds competes with that at any college or university - active, engaging, and fun…very fun! There are many things a Reynolds student can do to be involved on and off campus. One of the most common ways is to get involved is through clubs. Reynolds has over 25 different clubs, and welcomes ideas for more. There are clubs for spiritual beliefs, hobbies/interests, advocacy, careers, academic pursuits, honorary, and more! Some examples of current clubs include: The GSA Club for an LGBT presence and community; The Muslim Student Organization for all those whom share the Muslim faith or share an interest in it; The H.E.A.R.T Service for community engagement, volunteer work, civic engagement, and active service; Phi Theta Kappa, a 2-year college honorary society for students with exemplary academic achievements; CACEE for those interested or pursuing careers in culinary, pastry, or hospitality fields; and the Anime Club for those whom share an interest in Japanese animation. If a student finds that an existing club does not fulfill their interests, then they can contact the Office of Student Life to suggest a new club that suits such interests. Besides clubs there are special leadership programs students can be involved in. One of these is JSR LEAD, which is jointly run by First Year Initiatives and the Office of Student Life. The program starts in the fall semester, where a student applies and interviews for the program; expressing their interest and motivation for such an experience. JSR LEAD continues from the fall into the spring semester where selected students participate in leadership and teamwork activities, assessments to get to know themselves better (such as personality tests), and a leadership course. It is an amazing experience that builds leaders. Another leadership program Reynolds hosts is the Student Ambassador program, which is a paid position. Students apply and interview just as they do for the JSR LEAD program, and those selected undergo training, work SOAR orientation sessions, represent the college at events, and staff greeter tables at the start of every semester. Finally, for those students whom are interested in government, leadership, or politics in general there is Student Senate. A student must apply and interview to participate. Those selected serve as student leaders that represents their peers to college officials. They conduct surveys, investigate student issues, and address those issues with college officials. Reynolds’ Student Senate members have been responsible for many student-related changes on campus, for which many of their peers are grateful. In conclusion, there is a key concept I want all Reynolds students especially to keep in mind. All these activities at Reynolds are like treasures in a box. If you want to be involved, then reach out and open the box, and those treasures will be revealed to you. Although being successful in academics always comes first, choosing to get involved in student life activities will enrich your college experience and open many doors! From my own personal experience I can say that there are an abundance of exciting, engaging, and fun student life opportunities waiting for you. Why not get involved the Reynolds Way? Reynolds student Dylan Chaplin - Dylan is serving as a PR Assistant this summer as well as a Student Ambassador in the fall. He also served as the Vice-President of The H.E.A.R.T Service, which is a community service and civic engagement club designed to create connections between Reynolds and its surrounding communities. During his first two semesters at Reynolds he successfully completed the college's Leadership Program, JSR LEAD. In his spare time he likes to blog. Reynolds Community College Department of Police, in conjunction with the Richmond Police Department, Virginia Commonwealth University Police Department, Virginia State Police, Richmond Emergency Communications Center, Richmond Fire Department, VCU Medical Center and Richmond Ambulance Authority Emergency Medical Services held a multi-jurisdictional "active shooter exercise" on August 9 on the Downtown Campus. 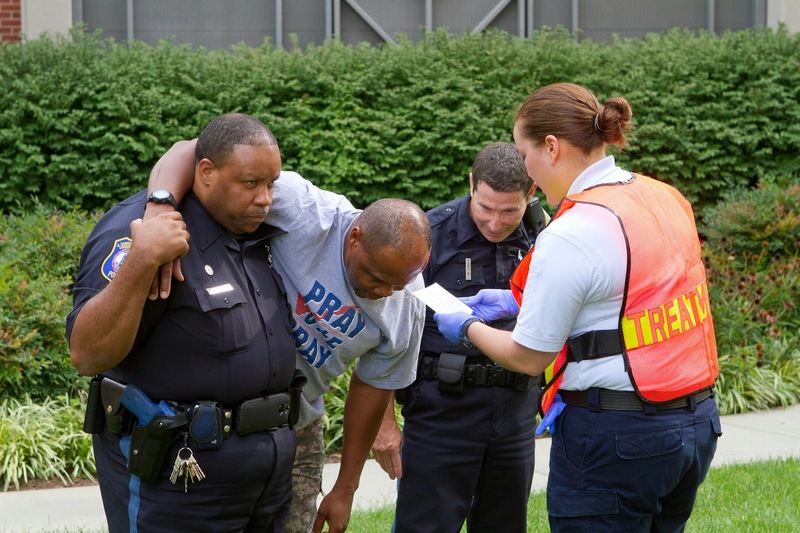 With over 125 participants, the drill began with an argument and simulated gunfire on 8th Street between the Reynolds and VCU parking decks. The incident then moved to the Reynolds parking deck and then inside the Reynolds campus building. Reynolds Police Department was the initial response team to the incident, followed by other local police, fire and emergency medical services personnel. 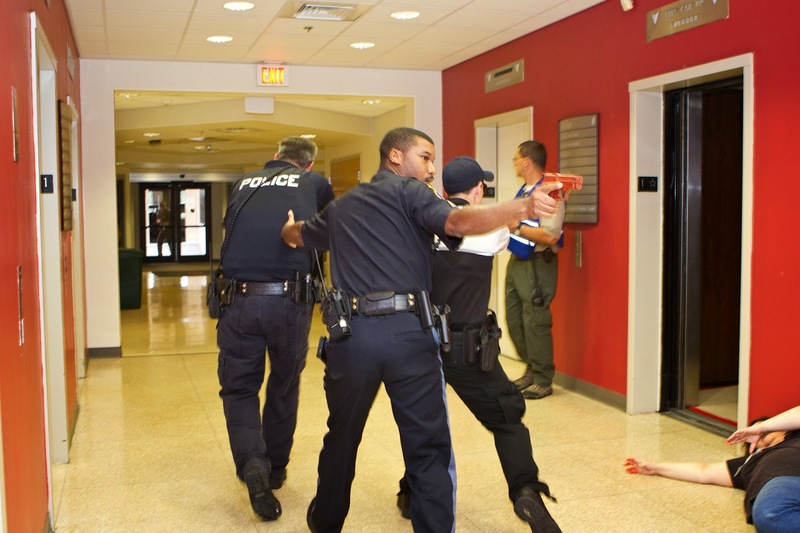 The successful active shooter drill is another important milestone of excellence for the Reynolds Department of Police, which earned accreditation by the Virginia Law Enforcement Professional Standards Commission (VLEPSC) in 2013 and is the first police department at a VCCS member institution to receive such an accreditation.